A place to post fashions that inspire your glee, your creativity, your laughter, your style, your love of beauty, your sense of humor, your wisdom, your whatever. A thread for friends, neighbors, strangers all, lesbians, bisexuals, str8s, queers, tops, bottoms, switches, femmes, girls, ladies, women, womyn, butches, bois, boys, guys, men, "she"s, "he"s, "hy"s, "zie"s and "per"s and anybody's little dog too. These are from my favorite designer Bettie Page, I adore the retro pin-up look! 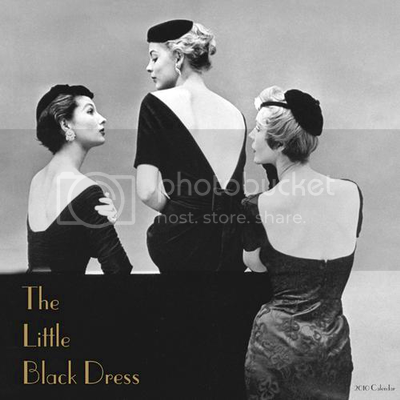 In 1926 Vogue called Chanel's Little Black Dress (LBD) the "Ford" of a woman's wardrobe. Every woman has a LBD. If she doesn't she should. Looking for something like this to wear under my tuxedo jacket. Can't get just the pic to post....hope this link works. I just LOVE this dress! "I'm so depressed I've worn the same outfit twice this week." My favorite period store for Victorian Era attire - the site has the images locked, so I can't post some of them.. phooey! There is a store in the South Bay Area, so I can actually go and try things on! I, oh, so want the brocade tailcoat! 60's! Talk about a mid-century fashion treasure chest for both women and men! I think I should have a mid-century dinner party so friends can just sit and look at these! I cut off all my curls about two weeks ago. I cried and cried. 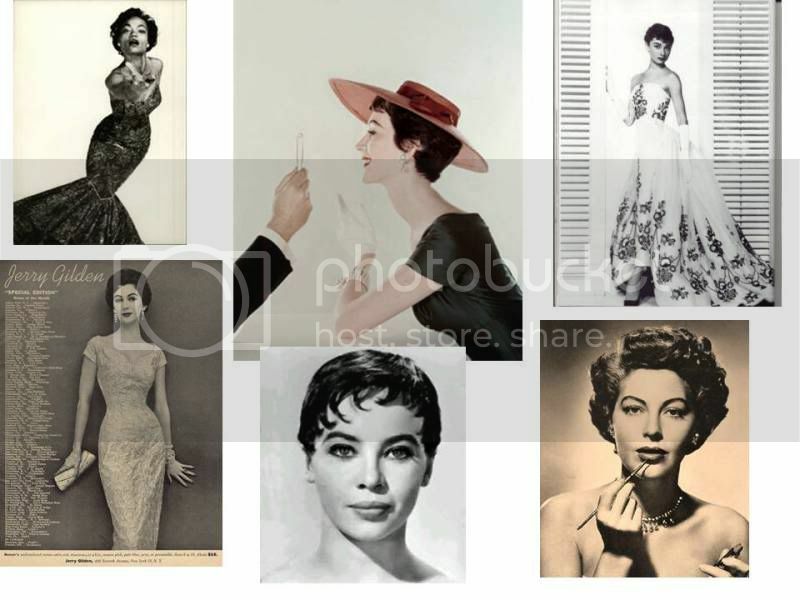 I realized as I looked at 1950's fashion and Hollywood pictures that the sophistication level of women who mostly had bobbed hair. Charming, intelligent and magnetic women. So when the last person who saw me (after not seeing me for months) saw my bobbed hair and said, "It is lovely. Very sophisticated." I had to smile. I have a variety of little black dresses (a few in cerulean blue or deep purples, too) - they range from sleeveless, plunging V-necklines to strapless to long-sleeved (more like 3/4 length sleeves) vintage styled dresses of the late 50s to 60s era dress styles. More than likely though, I'd probably have to make my own pattern and play with the ruffling on the neckline a bit. I'd change the type of fabric too - I like fabrics that feel stetchy-snuggly on my body. And, instead of the waistline (as shown in the photo), I'd probably make it an empire waistline and drop the neckline a bit, so it was more of a "vee" and adjust the ruffling - maybe use chiffon for the ruffling??? I was looking at lots of 50's fashions lately and a lot of them are 3/4 sleeves. I, too, have several LBDresses. I have short arms, so I love the 3/4 sleeves on shirts and dresses. Lovely, that dress is very pretty! I'd have to have an a-line though I do love the color. It'd make my Washington white skin glow. Isadora? Do you like to wear long-sleeved gloves too? Those are really hard to find nowadays! I would love to have a black pair of them!!! Plus, I have been keeping a watch out for a black stole (<~ did I spell that right?) ... I would like one of those too, if I could find one! *hehe* I so hear you on that Gemme! A-line for sure! I do have some cocktail dresses that are "stove-pipe" - fit wise - but I do tend to aim for comfort and what looks best on my body. I live in the Bay Area. Drag Queen heaven. I am lucky I can find gloves at The Piedmont in the Haight and Cliff's in the Castro. I have found them on line, too. Look for opera gloves on line. I love them. I wear satin gloves a lot. It is always colder in the evenings in the Bay Area. Keeps my hands warm. Oh!!!! Thanks Isadora - I never thought to search for them under the "Opera Gloves" ... great idea! 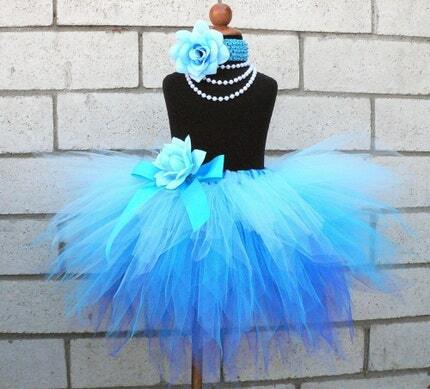 I so fetching love the baby blue tutu featured in your OP!